The border between Schleswig-Holstein (Germany) and Denmark is hardly noticeable: many people speak both German and Danish. According to estimations, there are around 50 000 people who belong to the Danish minority, and who have German citizenship. They are well organised and form a bridge between the two neighbours Germany and Denmark. The Danish minority in Germany lives in Southern Schleswig, which is the northern part of the land of Schleswig-Holstein. They live in the city of Flensburg, the districts of Nordfriesland and Schleswig-Flensburg and in the northern part of the district of Rendsburg-Eckernförde. 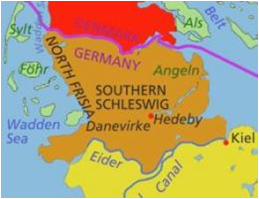 Southern Schleswig lies between the river Eider and the Kiel Canal in the south and the German-Danish border in the north; from the North Sea in the west to the Baltic Sea in the east (see map). The percentage of members of the Danish minority as a proportion of the total population of specific municipalities varies very much and ranges from municipalities with only few families to about 20% in the city of Flensburg and in some small villages. The vast majority of the members of the Danish minority understand and speak Danish. The regular use and promotion of the Danish language is the basis for all the minority activities. An uprising of the people of Schleswig-Holstein in 1848 against Denmark led in 1864 to a war between Denmark against Prussia and Austria. Since 1864 – after Denmark lost the war and Northern and Southern Schleswig were assigned to Prussia – there is an autochthonous Danish minority in Southern Schleswig (see also: Battle of Dybbøl). In the plebiscite of 1920 Northern Schleswig (the area of the former county of Sønderjylland) voted for Denmark, whereas Southern Schleswig in majority voted for Germany. Since that time the Danish minority exists as a recognised minority, with Denmark as their motherland. Since the plebiscite of 1920 and the new border that resulted from it, there is a minority on both sides of the border. In the period of National Socialist between 1933 and 1945 the Danish minority was victim to repressive measures, but they did not suffer from persecution like e.g. the minority of the Sinti and Roma did. On the other hand the members of the minorities were the only citizens of the Reich who were exempted from compulsory participation in the Nazi-organisations. The first years after the war the associations of the Danish minority were immensely popular. Two years after the war already approximately 100 000 people identified with the minority. Also the number of kindergartens and schools increased rapidly. Refugees led to a strong growth of the Danish movement. People spoke of the “New-Danish movement”. Among the “New Danes”, there were also many people who were not familiar with the Danish culture and language. They hoped and asked for a secession of Southern Schleswig from Germany and union with Denmark. Once the refugee problem in Schleswig-Holstein was solved, also the growth of the Danish minority waned. Furthermore, it became clear that Denmark was not interested in changing the borders, as the Danish minority requested, and that Denmark also never had asked for such a change. The atmosphere in the border region has been tense for a long time. Only in the run-up to the NATO-accession of Germany the situation fundamentally changed. In the run-up of accession by Germany, Denmark wanted to solve the minority issues in the border region as well. This succeeded in the end on 29 March 1955 and this resulted in the Bonn-Copenhagen Declarations, which are two parallel declarations that confirm the rights of persons belonging to the minorities in Northern and Southern Schleswig. Nowadays people describe the developments in the border region from “against one another” to “with one another” and “for one another”: these are important steps towards equality once and for all and an expression of good neighbourly relations in the border region. The Danish language is one of the Germanic languages of the Indo-European language family and belongs to the sub-group of Scandinavian (North Germanic) languages. Together with Swedish it forms the East Scandinavian branch. Thraces of the influence of the Nordic languages can be found in English nowadays, in words such as for example sky (Danish sky), law (Danish lov), window (Danish vindue) or the pronouns they, them, their (Danish de, dem, deres). The geographic proximity to Germany continuously influenced the Danish language, because many words were developed from the day-to-day cross-border contacts. A specific feature of Danish is that it has many dialects, which even for mother-tongue speakers of Danish can be difficult to understand. The Southern dialect of Jutland is called Sønderjysk. This dialect was originally spoken in the area of the current minority, but was superseded from the Middle Ages onward by Low German. Today Sønderjysk is still widely spoken in the southernmost part of Denmark, which borders on Southern Schleswig, but in Southern Schleswig itself there are only few speakers left. There are also so-called mixed languages, like for example a multi-ethnolect, which is spoken by some members of the Danish minority. This originates from directly translating from German into Danish without changing the syntax, from using germanisms and a German (relatively hard) pronunciation of Danish words. By the members of the minority this language is called Sydslesvigsk (Südschleswigsch in German) and regarded as a Danish dialect of its own. The legal recognition of the Danes as a national minority was laid down in the Basic Law and the German Unification Treaty. The Bonn-Copenhagen Declarations from 1955 are considered as a model for how to deal with national and linguistic minorities in Europe. They are two separate government declarations by both Germany and Denmark, which in 1955 recognised the minorities in either state, i.e. the Danish minority in Germany and the German minority in Denmark. The declarations do not provide special rights; they confirm the freedom of identification with the minority and equal treatment of all citizens. The declarations expressly acknowledge that “the identification with the Danish nationality and the Danish culture is free” and that “it is not allowed to officially negate or examine this”. Another result was that the Sydslesvigsk Vælgerforening (SSW), the political party of the Danes – like already before 1953 for the federal German parliament – was also exempted from the threshold of 5% on the level of the land of Schleswig-Holstein. The Bonn Copenhagen Declarations are nowadays complemented on the European level by the Framework Convention for the Protection of National Minorities and the European Charter for Regional or Minority Languages. The Charter was ratified by the German federal government in 1998 and entered into force on 1 January 1999. As a consequence, Germany pledges to protect Danish as a minority and regional language, whereas the measures are limited to the federal land of Schleswig-Holstein, where the language is spoken. The Framework Convention for the Protection of National Minorities was ratified by the German federal government in 1997 and entered into force on 1 February 1999. Since then three state reports on the Framework Convention and five reports on the Language Charter were submitted to the Council of Europe. (1) Identification with a national minority is free; it does not release someone from the general civic duties. (2) The cultural autonomy and political participation of national minorities and ethnic groups are protected by the Land, by the municipalities and associations of municipalities. The Danish national minority, the minority of the German Sinti and Roma and the Frisian ethnic group are entitled to protection and support. (3) The persons with parental authority decide whether their children enrol in a school of a national minority. The Sydslesvigloven was adopted by the Folketing (Danish Parliament) on 23 March 2010. The act guarantees and ensures Danish state subventions for among other things education and training for the Danish minority, but also for culture and public relations. The Danish minority in the northern part of Schleswig-Holstein has an extensive network of associations and establishments, which are funded by grants from the two states. This network guarantees functional cultural autonomy for the minority. “Sydslesvigsk Forening/SSF” (Southern Schleswig Association), which was established in 1920 as “Den Slesvigske Forening” is the main cultural organisation of the Danish minority. Its secretariat in Flensburg is the main place to go for issues related to cultural in general and for minority policy issues. As umbrella organisation SSF is coordinating the work of another 24 associations of the Danish minority. The task of SSF is to extend and foster Danish language and culture in the region of Southern Schleswig. Apart from its work in the social and cultural field, SSF and its own political party “Sydslesvigsk Vælgerforening” (SSW) represents the political interests of the minority. Each year, the Danish minority receives grants of a total of 500 million Danish Kroner. That covers about 2/3 of the total costs of the minority. The remaining third is funded by grants from the German state and by membership fees. The Southern Schleswig Voters’ Association (SSW) The Southern Schleswig Voters’ Association (SSW) was founded in 1948 as party of the Danish minority in the region Schleswig and by the Frisians in Nordfriesland. Since 1955 SSW has been exempted from the 5% threshold that normally has to be attained in order to enter the Landtag (regional parliament) of Schleswig-Holstein. For federal election in Germany this is already the case since 1953. From 1947 SSW has been represented in the Landtag in Kiel. In the 18th Schleswig-Holstein Landtag (2012-2017) SSW is represented – as third-largest party in Schleswig-Holstein – with three members of parliament. It also holds the position of Minister for Justice, Europe and Culture, Anke Spoorendonk, in the government formed by the Social Democrats, Greens and SSW. The political profile of the party lies in between that of the two large German parties, the Christian Democrats and the Social Democrats, and is inspired by the political and social developments in the Scandinavian countries. SSW essentially tries to achieve a decentralised policy that is as close as possible to the citizens. Other establishments and associations coordinate their activities in “Det sydslesvigske Samråd” (The Joint Council of Southern Schleswig). These organisations are “Sydslesvigs danske Ungdomsforeninger” – SdU (Danish Youth Association for Southern Schleswig), the “Dansk Kirke i Sydslesvig” (Danish Church in Southern Schleswig) and “Dansk Sundhedstjeneste for Sydslesvig” (Danish Health Service for Southern Schleswig), which among other things manages a Danish retirement home. The library system with several local branches is organised by the “Dansk Centralbibliotek for Sydslesvig”, which has a wide supply of media and also offers cultural activities and Danish language courses. The daily newspaper ”Flensborg Avis”, which also includes a German-language section, has a circulation of about 5 500 (in 2011) and is the mouthpiece and source of information for the minority. The Danish School Association for Southern Schleswig manages kindergartens and schools for members of the Danish minority. The association manages: 55 kindergartens, 47 schools (two with upper secondary education), a student residence in Flensburg (Ungdomskollegiet), a community college (Jarplund Højskole), two rural school hostels, a central office for teaching materials, a school psychological service and a travel agency for arranging holiday trips for school students to Denmark. On 1 September 2010 the number of children in the Danish kindergartens was 1 921. On 1 September 2010 the total number of school students was 5 636. The percentage of Danish students as a proportion of the total number of students in Schleswig-Holstein is about 1.8 percent. The operative costs of the School Association are covered for 50% by the Danish state, for 43% by the German state, for 3% by the districts and municipalities and for 4% by self-financing. Since 1955 all the schools of the minority are officially recognised by the state. They are also attended by children of people who have German as their mother tongue. Before a child can attend a Danish kindergarten or a Danish school, the parents are informed that the everyday language of the institutions is Danish and that a feeling of belonging to the Danish minority is desired. The Danish schools have a special status according to the Schleswig-Holstein School Act, entailing that even though they are private schools in legal terms, they have the same importance for the Danish minority as the public schools have for the majority population. This special status was included in the School Act in 2007. The diplomas of the minority schools have the same legal value as those of the public schools. Therefore the state requires a degree of approximation to the curriculum of the public schools, in terms of substance and structure. German and Danish classes are both taught in the mother tongue. In the other subjects the language of instruction is Danish, whereas special attention is paid to ensure that students become familiar with the technical vocabulary in both languages. 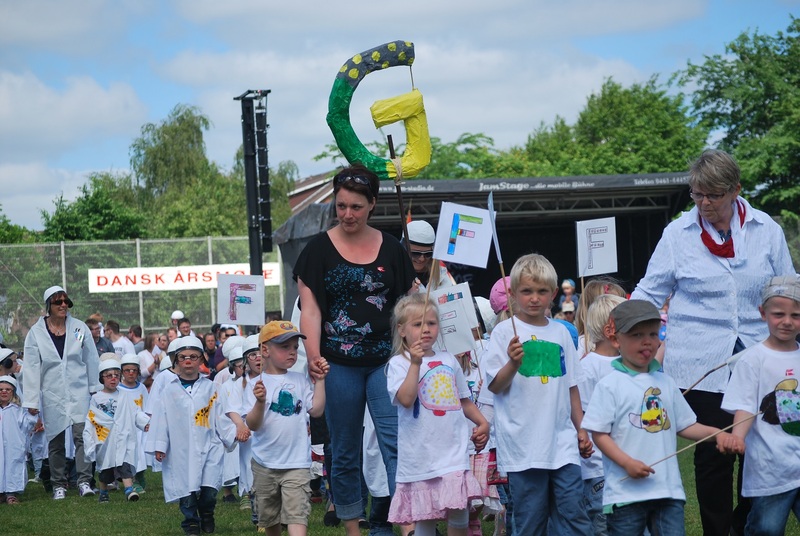 More than 90% of the children attended a Danish kindergarten before their first day at school. Kindergarten and school build on one another and in particular in kindergarten there is much focus on language education, in order to ensure a smooth transition to the Danish school. By these organisations and by school education in Danish the Danish language is promoted and the preservation of this language within the minority is guaranteed. The Danish language is of essential importance for the identity of the Danish minority, although it is not an indispensable criterion for the identification of the members of the Danish minority.